Christmas will be here before we know it. If you are anything like me, you’ll be getting into full festive mode round about now and starting to think about what to buy for friends and family. 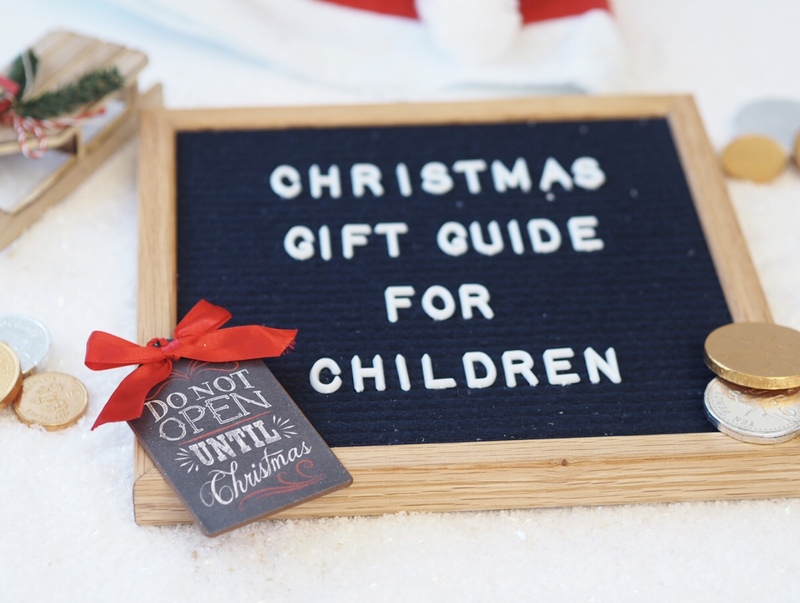 I thought I would kick off this year’s Christmas Gift Guide series with present ideas for children, as I often find them the hardest to buy for. With new toys, books and games coming out all the time and children’s minds changing like the wind, it can be extremely difficult to decide what to buy for little ones. Here are some of the items out there that I think would make brilliant gifts for children this Christmas. As soon as I laid eyes on this cute miniature bike I knew that Benjamin would love it. I have always been a fan of smaller versions of things and this bike is just adorable. The Toddlebike2 arrived already assembled and ready to ride and Benjamin absolutely loves riding it around the house and outside on the decking. It is a brilliant vibrant red colour with black wheels and handlebars and it would make the perfect present for a toddler this Christmas. Benjamin absolutely loves colouring but often art sets are aimed at older children. I was pleased to find that the My First Colouring Set from Maped Helix is suitable for children aged one and over. It includes 10 ultra-washable felt tip pens, 12 crayons and a giant poster, all packaged together in a handy carry case. I know Benjamin will love getting to grips with this and having his own art set to enjoy. Another offering from Maped Helix, the Color Peps Finger Paint set is also suitable from 12 months and includes four primary colour paints. Encourage your little one to get their hands messy with this set, which has been dermatologically tested. If your toddler is anything like Benjamin, they love making a noise. This brilliant Mini Band Set from Hape provides them with a selection of instruments to try out. Who knows, perhaps it will spark a lifelong hobby! The instruments include a tambourine, ukulele, clapped, rattle and rainmaker, making this set fantastic value. I am a huge fan of personalised story books. This Where Next Teddy? book from Chapterful can be personalised with your child’s name as well as being able to adapt the main character’s illustration to match their appearance. The story takes them on an adventure with Teddy which involves a trip into space. Each page includes lovely scenes to keep children enthralled throughout. I am looking forward to reading this with Carly at bedtime and think it would make a lovely gift that can be enjoyed together. Another personalised item, the personalised rabbit from Giftpup is gorgeous – so soft and cuddly and made with high quality materials to last. You are able to personalise the bunny with your child’s name in either pink or blue text, which makes this adorable cuddly toy even more special when unwrapped at Christmas. The fur is a lovely soft grey and Carly is going to love adding the bunny to her every growing toy collection on her bed. Dental care is so important and it’s a good idea to get children used to cleaning their teeth properly from a young age. The fantastic Playbrush Smart connects to a smartphone to encourage children to clean teeth with interactive games. It even gives personalised brushing feedback, providing peace of mind that they are getting those hard to reach areas and brushing for long enough. Something a little different, Shimmeez are available from Menkind and come in a variety of different characters including this cute little pig. The children all love the reversible sequin trend that can be found on anything from clothes to cushions lately and these toys are bound to keep kids entertained. I must admit, I found it oddly therapeutic to stroke the toy to change the pink sequins to gold. There is something so magical about fairies. Ever since I watched the film FairyTale when I was younger, I have loved the idea of leaving items out for the fairies and I have tried to pass this on to Carly. She loves hunting for fairies at the bottom of the garden and I know this fairy door set from Reroom would go down well with her. The set includes a beautiful door (available in a range of colours), a tiny magic key, stepping stones, a fairy notepad and a fairy/family lease agreement as well as a little guide explaining everything you need to know about fairies. You can also opt to sign up for a newsletter which provides weekly content including stories and play ideas to keep their imagination alive. Is there anything more fun than building a really tall tower of bricks and seeing how long it takes for it to fall down? That’s the concept of this toppling tower game available from Amazon. The children absolutely love using their imagination when it comes to playing with their toys and these brilliant Ready 2 Robot Battle Packs, available from Smyths Toy Stores, will provide hours of fun for kids. These battle packs have two figures inside, including a mystery figure, and you can mix and match the pieces before pitting the figures against each other in a battle. Suitable for children aged 5 and over, the kids have already started playing with this set and loved it so much Carly has got another one for her birthday. The Bath Bombs set from Interplay is perfect for children who like creating. This set is suitable for children aged 8 plus and includes everything you need to make up to 8 bath bombs, including gift wraps and tag so that they can give their creations to others to enjoy! I am a huge fan of The Book of Everyone and this new offering from the brand is sure to be another hit. The Wise(ish) Words for Kids book can be personalised with a little message on the front cover as well as it being possible to choose which quotes you want to include on each page. Also available for dog lovers, foodies and graduates, this fun but thoughtful gift will make the perfect gift this Christmas. I love teaching the children how to care for animals and this Window Bird Feeder from Interplay makes a lovely gift, which can be used together. The set includes everything you need to get started including all the fixings and a one-way mirror to allow close-up viewing. All you need is some bird food. To keep with the nature theme, this Bee & Insect House from Reroom is brilliant for children who enjoy conservation. Bees are so important for the human race, and this cute product is perfect to help teach children about their role and enable them to help care for them. The interactive Guiness World Record – Do Try this at Home game is one for the whole family, suitable for those aged 8 and over. Test your knowledge on the world’s most famous records alongside completing your own challenges using household objects! It’s sure to amuse over the holidays! I really like gifts which are educational but fun at the same time. I fell in love with this brightly coloured wall clock from Born Gifted as soon as I saw it. It helps children to learn to tell the time, or improve the confidence of those who already know the basics. Cameron loves anything with his name on and this clock will be perfect to hang on his wall. Safety is paramount when the children go out on their bikes, scooters and skateboards. Helmets and pads aren’t the most appealing of things for kids but The Hornit have you covered, literally, with their quirky range of illustrated helmets for children. The Mini Hornit Lids come in a variety of styles inluding the Commander and Candy designs featured. The helmets are available in small and medium, with a handy size guide on the website to help you choose which one you will need. Perfect stocking fillers for sporty kids, these Laceeze bands are designed to help stop laces coming undone during active sports and come in a range of colours including the orange and black. A fantastic gift for inquisitive kids, the Pocket Microscope from Interplay is easy to use, fully transportable (it folds down to fit in your pocket) and is can be used in science experiments and for studying nature. The microscope magnifies 30 times the actual size and includes 8 pre-mounted samples, spare mounting slides, specimen jars and an activity booklet. Another one for nature lovers! This set from Interplay is brilliant for fans of bugs. The set provides a fascinating insight into the World of Worms, allowing children to observe them in their natural habitat whilst learning about how they contribute to the world. Including everything you need to get started – just add worms! The products featured in this post were kindly gifted to me, however all words and photos are my own.